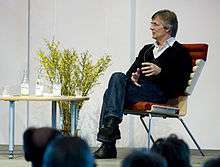 Bille August (born 9 November 1948) is a Danish Academy Award-winning film and television director. His film Pelle the Conqueror from 1987 won the Palme d'Or, Academy Award and Golden Globe. He is one of only eight directors to win the Palme d'Or twice, winning the prestigious award again in 1992 for The Best Intentions, based on the autobiographical script by Ingmar Bergman. He was married to Swedish actress Pernilla August from 1991 to 1997. His son Anders August is a screenwriter. On 23 September 2011, Bille August announced that he had opened his studio in Hangzhou, China and taken a position as Tianpeng Media's Art Director, aiming to produce Chinese films for Tianpeng Media over the next few years. Tianpeng Media is a new media company established in 2010. The company so far has produced two films, The Women Knight of Mirror (竞雄女侠秋瑾) and The Years of Qi Xiao Fu (七小福之燃情岁月), which will be released later this year. Bille is the first foreign director to be hired by the Chinese film company. Recently, August also accepted the invitation from the Hangzhou government to serve as a "culture consultant" for the city. His 2013 film Night Train to Lisbon premiered out of competition at the 63rd Berlin International Film Festival. Entered into the 11th Moscow International Film Festival. based on the book by Danish writer Bjarne Reuter. Screened at the 1983 Cannes Film Festival and the 13th Moscow International Film Festival. Tro, håb og kærlighed (1984, Twist and Shout). Entered into the 14th Moscow International Film Festival. won the Golden Palm at the 1988 Cannes Film Festival, the Academy Award for Best Foreign Language Film and the Best Film award at the 23rd Guldbagge Awards. won the Golden Palm at the 1992 Cannes Film Festival. based on a novel by Chilean author Isabel Allende. based on a novel by the Swedish author Selma Lagerlöf. based on the novel Miss Smilla's Feeling for Snow by Danish author Peter Høeg. based on the novel of the same name by French author Victor Hugo. ↑ "Academy Award-winning director Bille August opens his studio in Hangzhou". Asia Pacific arts. 10 April 2011. ↑ "Berlinale 2013: Competition Now Complete". berlinale. Retrieved 25 January 2013. ↑ "11th Moscow International Film Festival (1979)". MIFF. Archived from the original on 3 April 2014. Retrieved 18 January 2013. ↑ "Festival de Cannes: Zappa". festival-cannes.com. Retrieved 20 June 2009. ↑ "13th Moscow International Film Festival (1983)". MIFF. Archived from the original on 7 November 2013. Retrieved 31 January 2013. ↑ "14th Moscow International Film Festival (1985)". MIFF. Archived from the original on 16 March 2013. Retrieved 8 February 2013. ↑ "Festival de Cannes: Pelle the Conqueror". festival-cannes.com. Retrieved 27 July 2009. ↑ "The 61st Academy Awards (1989) Nominees and Winners". oscars.org. Retrieved 20 August 2015. ↑ "Pelle Erobreren (1987)". Swedish Film Institute. 15 March 2014. ↑ "Festival de Cannes: The Best Intentions". festival-cannes.com. Retrieved 14 August 2009. ↑ "Berlinale: 1997 Programme". berlinale.de. Retrieved 12 January 2012.